Ingredients: cocoa mass, sugar, cocoa butter, emulsifier: soy lecithin, natural vanilla. Added ingredients: crystalised ginger pieces (Cocoa solids 55% min). Allergy information: Contains soy. May also contain traces of nuts as these products are handled in our factory. Suitable for vegetarians. Gluten free. 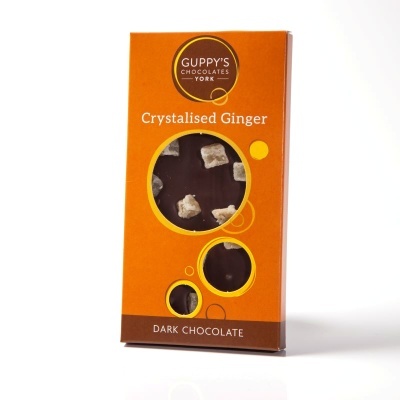 Ginger has a long tradition of being very effective in alleviating many ailments such as indigestion, nausea and it is believed to have anti-inflammatory qualities. It is also incredibly aromatic and the zingy, warming flavour electrifies your taste buds!